Creation of two original sand animation performances (duration: 11:30 + 03:30 minutes) for a company event, and the audience was around 400 people. 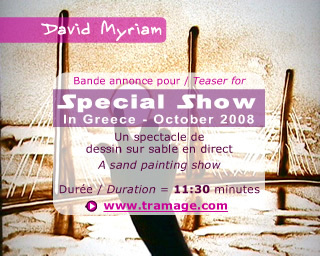 These special live sand shows were scheduled on October 22,23 2008, at Athens Intercontinental Hotel. Original music by Gérard Bonnotte.